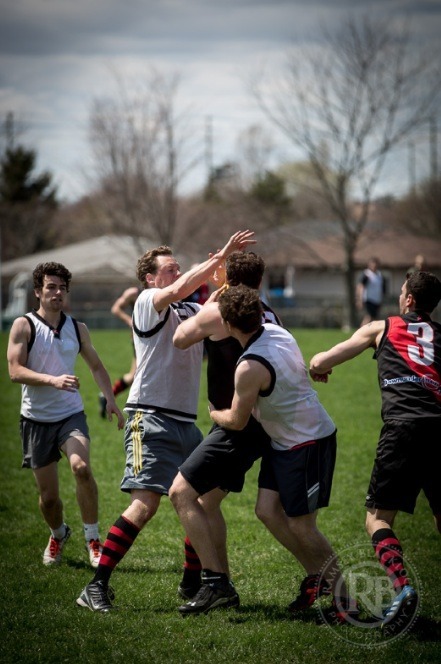 In May the Toronto Dingos Football Club seized a small rugby field in Barrie for the day and played their first ever football intra club match. The group of 33 started the morning with skills, fitness and role play and were then split into teams for the remainder of the day for the intra club match. "It's been a great day for the club. Really good to see 33 blokes here wanting to participate," said president Mick McFarlane on the day. "The day is more about getting together as a team and bonding rather than the result of the intra club. It's been a lot of fun - especially for the rookies." Defender Ramsey Blacklock took time out of some of the drills to capture the players being put through their paces. Here's the album of the Barrie Footy Trip. Here's where you can find Ramsey's work.